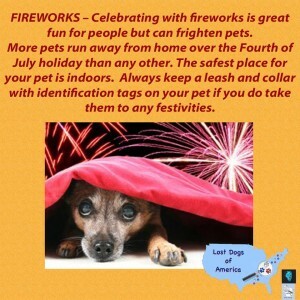 Fireworks preventative tips and what to do if your dog goes missing. 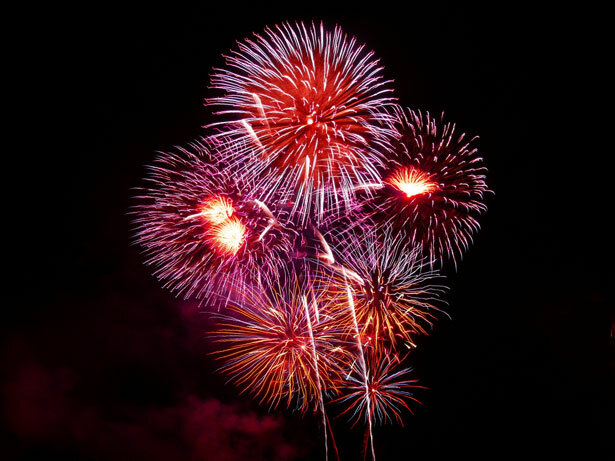 Noisy parades, loud music, neighborhood picnics, and, of course, fireworks, –these summertime traditions are all great fun for people, but they are traumatic and dangerous to their pets. 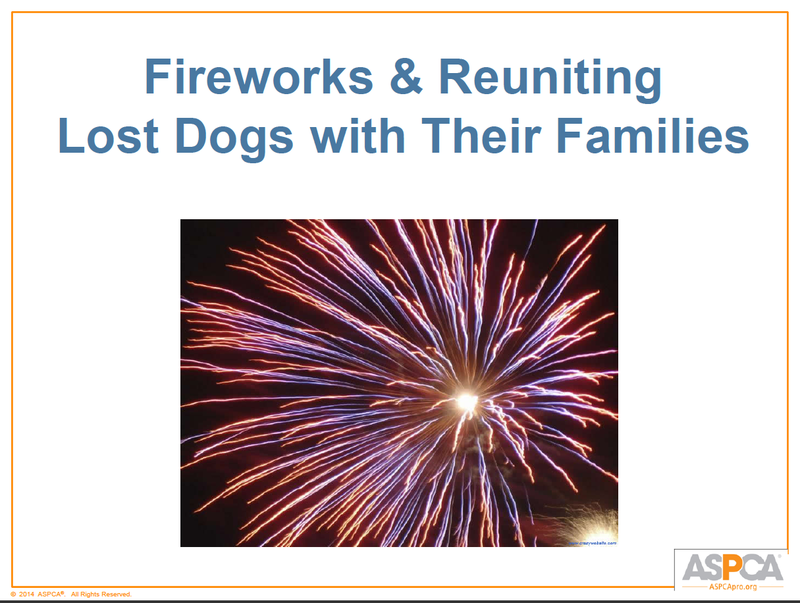 More pets run away from home over the Fourth of July holiday than any other. And with many towns holding fireworks displays throughout the summer, summertime escapes are becoming more and more commonplace. Many dogs experience similar phobias during thunderstorms or when loud music is being played. Your dog may show the following signs: shaking, drooling, howling or barking, finding a place in the house to hide, and loss of bladder or bowel control. 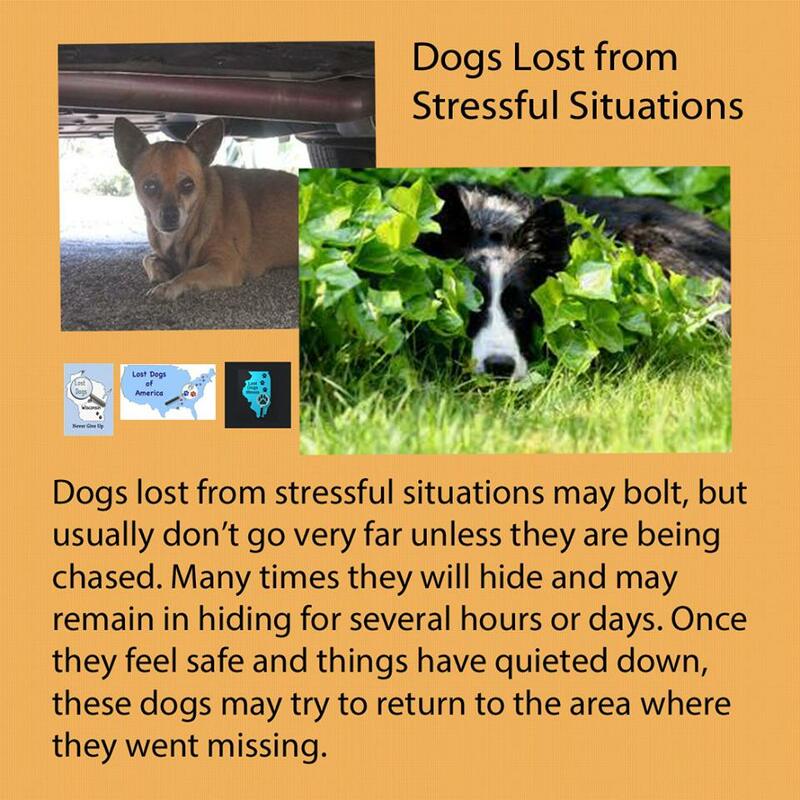 Lost Dogs Illinois/Lost Dogs Of Wisconsin offers the following tips to keep pets feeling safe and secure when during fireworks or thunderstorms. Take your pet for a walk or play date before the fireworks start. This allows your dog to exercise, release energy and, of course, go “potty”. Keep pets indoors. They may even feel safer if they are placed in a smaller interior room with a radio/tv playing. Close your windows. Dogs, in particular, can try and get out of the house by pushing out the screen. Dogs have been known to bolt through screen doors so keep your inside door closed. Resist the urge to take your dog to the local Independence parade and festivities. Loud, crowded activities are no fun for your pets. Check your fence line for loose boards or openings that your dog could slip through or dig out of. 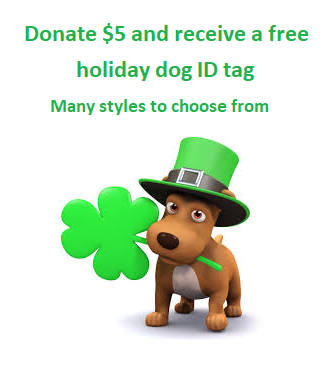 We suggest during these activities, you even keep a leash on your dog and walk him/her in the fenced yard. Make sure your pet has a license and a readable, up to date identification tag on his/her properly fitted collar and consider having a microchip identification inserted into your pet. 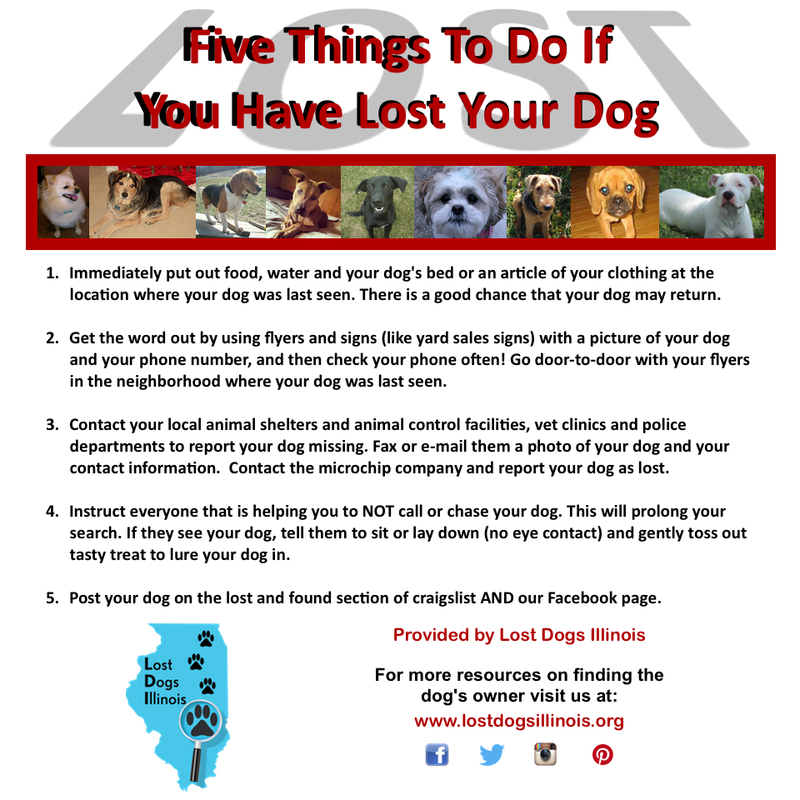 If your dog does accidentally escapes, please follow our 5 Things to Do if You Have Lost Your Dog. LDI/LDOW wishes everyone a safe holiday! This entry was posted in Fireworks, July 4th (Fourth of July) and tagged 4th of July, Fireworks on June 17, 2013 by Susan. 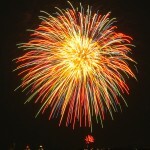 This entry was posted in Fireworks, Photo Tips on May 11, 2012 by Susan. 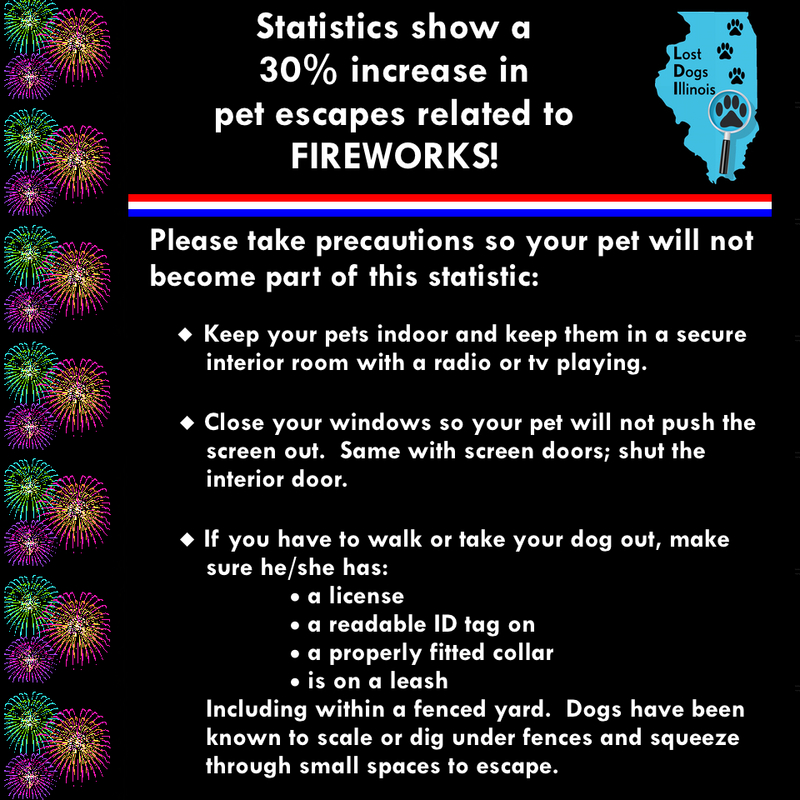 Keep Your Dog Safe during the 4th of July Holiday! Take your dog for a walk or to the dog park before the fireworks start. 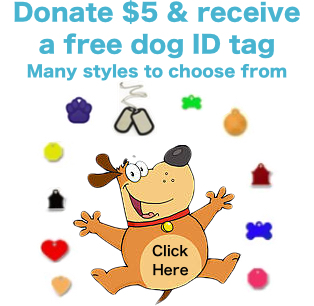 This allows your dog to exercise, release pent up energy and go “potty”. Keep dogs indoors. They may even feel safer if they are placed in a smaller interior room. Give your dog an interactive toy like tasty treat filled Kong. Close your windows. Dogs can try and get out of the house by pushing out the screen. Turn the air conditioning or radio on. Make sure your dog has a license and an identification tag on a properly fitted buckled or martingale collar and is microchipped. If your dog is shy and/or fearful, walk the dog with collar and a harness, clipped together or with two separate leashes. During this time of festivities and fireworks, do not let your dogs out alone even in a fenced yard. Keep a leash on your dog – dogs have been known to scale fences to get away from the noise. Most importantly, please do NOT take your dogs to the fireworks celebration! This entry was posted in Fireworks, July 4th (Fourth of July) and tagged 4th of July, Fireworks, July 4th on July 2, 2011 by Lost Dogs Illinois.